What kind of restaurant are you looking for? 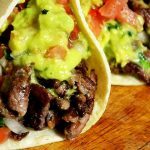 Taco, shrimp, pizza, steak, salad, sandwich, Italian, Chinese, French, Mexican, fast-food or fine dining, kid friendly or romantic? 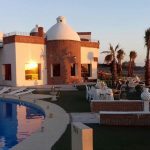 What’s Up San Carlos can help you find restaurants and eateries in San Carlos and Guaymas, Sonora, Mexico. If you’re dining on a budget, don’t worry, you won’t go hungry. You can easily dine for under $10 including a drink. For example, two tacos with all the fixings and two drinks will only set you back $80 pesos ($6.50 USD / $6.70 CDN). 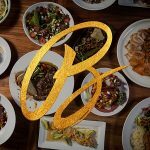 Embarcadero Cocina + Bar is open daily, serving breakfast and lunch buffets and dinner a la carte. Special Promotion: 140 pesos buffet breakfast for women Monday to Friday. The San Carlos Country Club and Golf Course has something for everyone! The Palapa Bar by the pool is open from 7:00am to 9:00pm and the pool is open from 9:00am to 9:00pm. Come in and ask about the great food and drink promotions. 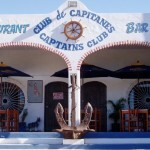 Enjoy delicious Greek food, seafood, cold drinks and live music on Posada Beach. You can sit in the open-air, palapa covered restaurant, or on lounge chairs on the beach. 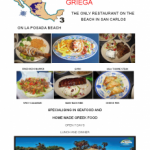 La Palapa Griega is open 7 days a week for lunch and dinner. Our friendly staff is waiting to serve you. Enjoy air conditioned beach-front dining at El Mar Restaurant. Open every day but Monday from 7am – 10pm, and serving breakfast, lunch and dinner. There are Daily Food Specials. Feast on our Sunday Breakfast Buffet from 8am – 12pm. Serving you breakfast, lunch, and dinner, Jax Snax has the biggest and best variety of food on the menu for the whole family! Daily breakfast specials. Best burgers in town. Teriyaki chicken or beef rice bowls. Pizzas. Mexican dishes. Salads. Plenty of Vegetarian options. Milkshakes….and much, much more. Our licensed restaurant serves beer and wine. There is no corking fee if you bring your own wine. We’ll cook your fish for you, plus two sides for only 75 pesos. Captains Club is the best “harbor hangout” in town. Restaurant/bar serves the coldest beer in town and the freshest food available. 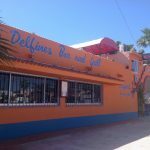 Delfines Bar and Grill offers a fine dining experience in San Carlos. Open for lunch and dinner, Delfines uses only the highest quality locally sourced and imported ingredients. The Delfines dinner menu is spectacular, offering a wide variety of 18 specialty entrees served with soup or salad. Three San Carlos favorites are Kung Pao Chicken, Filet Stroganoff and Proscuitto / Asiago chicken pasta. Delfines also serves a daily dinner special and fresh catch of the day. 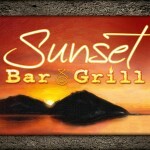 Sunset Bar & Grill: casual dining with flare with your feet in the sand. Located right next door to the Soggy Peso Bar on the beautiful soft white sands of Algodones beach, Sunset Bar & Grill has something for everyone. Our dining atmosphere is hippie eco-chic. HammerHead’s Dockside Bar & Grille. Check out the best sports bar in town. Located at the San Carlos Marina. HammerHead’s Dockside Bar & Grille is your best choice for great meals, cold drinks and great atmosphere. Come watch the sun set behind Tetakawi and the boats come and go from the marina. Froggy’s Bar. Any bar can be cool, but AWESOME takes practice. And in San Carlos, that AWESOME bar is Froggy’s Bar! Fashioned after the ever popular Carlos’n Charlie’s and Senor Frog’s franchises, Froggy’s is The Bar Where the Locals go to Party! 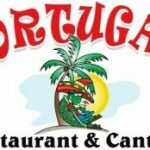 Tortuga’s Restaurant is an upbeat restaurant and bar, conveniently located right here in town. Come in, have fun, laugh a lot, and try the Best Hamburger in Sonora. Open every day serving breakfast, lunch, and dinner. Enjoy Phillipe’s famous sports bar menu and discover new menu items from his new fresh bistro restaurant. Colibrí Restaurant & Bar is a garden oasis like no other in San Carlos. Colibrí is your best choice for an intimate, romantic dinner or for a fun outing with a bunch of friends. With three separate dining areas, the choice is yours. The restaurant features Tapas (small plates), International entrées, delicious mesquite wood-fired pizzas, made in-house ice cream, and Italian gelato. Join us at La Conquista Cocina Mar y Tierra, where your taste sensations will be delighted. It’s fine dining with a special touch. Our upscale palapa restaurant, conveniently located on the main street across from San Francisco beach, has a varied and eclectic menu that is sure to please you. Meat, chicken, seafood, pasta, or vegetarian food — we have it all. Enjoy a delicious meal and a beer while watching sports on one of our big screen TVs…or just take it all in from the comfort of your seat under our huge oceanview Palapa. 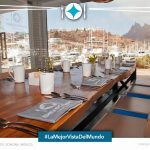 Looking for a casual dining experience in the heart of San Carlos with views of the beautiful Sea of Cortez! Then look no further than La Bartina 64 – located upstairs in the Seascape Plaza. 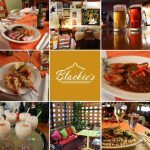 Blackie’s Restaurant & Bar has been a staple in San Carlos for 20 years, offering a delicious dining experience and excellent service for its national and international guests. If you want home-made, quintessential Mexican food, then come to Maria’s Restaurant Bar, where traditional Mexican cooking is our specialty. Maria’s invites you to enjoy a special breakfast, like our popular Omelette Tony filled with cheese and Chilaquiles and topped with red and green salsa. For lunch or dinner, why not try the delicious Mexican combination platter, the Chile Rellenos, or our Enchiladas with rice. 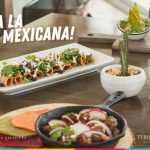 At the new Turquesa Restaurant, admire the beautiful Sea of Cortez and watch the sunset from our outdoor patio or air-conditioned restaurant. 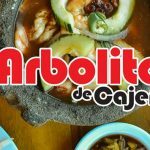 Los Arbolitos has been serving its clients delicious meals for the past 25 years and is one of the most popular restaurants in the State of Sonora. 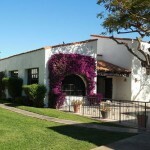 Los Arbolitos prides itself on its excellence in cuisine and on its customer service. Come on in and give us a try. Hacienda Mar de Cortez: Mexican-style restaurant surrounded by beautiful landscaping at Pilar Condominiums. Come in for daily food specials and happy hour. Come before sunset and stroll along one of the most beautiful beaches in San Carlos. Check out the new Shots Bar, Club & Restaurant! We’re located on the malecon at Marina San Carlos. Come and join us to have a drink in a fun, casual setting; to watch your favorite sports team; or to dance the night away. With indoor and outdoor seating for over 70 people, we have something for everyone. Enjoy our varied international menu made with fresh ingredients from local vendors created by chef Judy Harris, a variety of amazing shots and martinis, and fabulous views of the beautiful marina and Tetakawi. 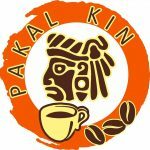 Fresh roasted coffee, from Chiapas. Coffee, tea, espresso, various cold flavored frappes, iced teas and coffees. Fresh roasted beans by the pound. The very friendly staff at Barracuda Bob’s serves delicious breakfast croissants, quiche, burritos, sandwiches, Sonoran Chili, home made muffins, cookies, pastries, ice cream and coffee. We’re open every day from 6:00am to 2:30pm for breakfast and lunch. Barracuda Bob’s is conveniently located at Marina San Carlos (in the yacht Club building). You haven’t experienced San Carlos, Mexico until you’ve been to Tequila’s. Named after Mexico’s national drink, Tequila’s Restaurant & Bar is the quintessential Mexican experience. Our Sports Bar has been family-owned for over 30 years. With Daily food specials, Daily Happy Hours, 2 Pool Tables, 4 big-screen TVs, free wireless internet, and lots of parking, Tequila’s is the perfect place to relax and enjoy the best Mexican food in San Carlos. 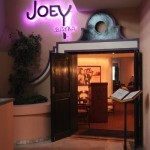 Joey Bistro: specializes in delicious Italian food and wine. Have you eaten at Amore Mio Italian Restaurant? What did you think? Have you eaten at Boye’s Burger Joint? What did you think? Address: Blvd. Benito Juarez, Guaymas (past the Soriano supermarket, on the right side of the street. Look for the large orange Mariscos sign). Have you eaten at Las Cachoreadas? What did you think? 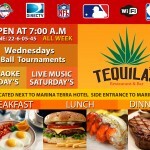 Address: Mariscos y Cocos el Novillero is located across from the baseball stadium in Guaymas. Proceed down Benito Juarez (it curves all over, but stay on it. It’s the street that the older Soriana is on). The restaurant is on your left, across from Oxxo, Pemex and the stadium.